Hi, everyone! You might have seen my note in a previous NorCal Solar newsletter. This past May I bicycled in a charity bike ride – the California Coast Climate Ride. I raised over $5,000 for NorCal Solar, the American Solar Energy Society, and the Climate Ride organization. THANK YOU to everyone who donated so generously! That $5,000 is an impressive number! Here’s a quick report: the route was 320 miles (Fortuna to San Francisco). It’s a hilly route, starting inland at Fortuna then south along the Avenue of the Giants (redwood forest) then to the beautiful Pacific coast. My knees were not accustomed to that many uphills, and my bike had an issue on downhills, so I didn’t ride every single mile. But it was overall a great experience with 106 other spirited, enthusiastic, earth-friendly cyclists from many parts of the country. At the campgrounds in the evenings, we had guest speakers addressing various environmental topics, including Paul Hawken, a Bay Area writer and researcher whom you might recognize from his previous work on the Smith and Hawken gardening catalog. Climate Ride provided wonderful food, and a pair of massage therapists helped us loosen our tight cycling muscles each evening! 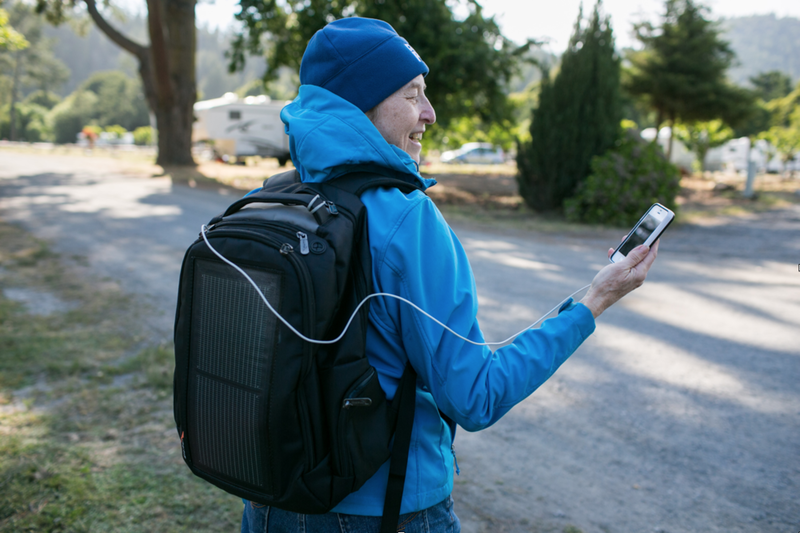 I’m delighted to say that I bought a small backpack with a flexible solar panel built into it right before the ride (see photo), and I used it to charge my cell phone several times. It worked great, both while I was riding and when I stopped at rest stops! The Climate Ride group organizes a number of multi-day rides and hikes each year around the country to bring like-minded people together for mutual support, to raise money for nonprofits doing great work on clean transportation and energy and a host of other environmental areas, and to raise awareness about these issues. Think about it if you love to cycle or hike! Some of the 2017 events are already decided – visit ClimateRide.org. Thanks again for your support! AT THE END OF ONE DAY, I GOT THE PHOTOGRAPHER’S ATTENTION TO HELP ME SHOW OFF MY SOLAR BACKPACK. HERE’S THE ENTIRE GROUP FOR OUR FINAL PHOTO IN SAN FRANCISCO! WE’RE WEARING OUR MATCHING CLIMATE RIDE CYCLING JERSEYS. Comments on "Elaine's Climate Ride 2016"